We’re about 40% through the current major league baseball season. That means we’re about to enter the warmest part of the season both on the field and in the standings. Contenders will begin to emerge and pretenders will begin to fade if they haven’t faded already. So we thought it was a good time to have our first installment of MLB power rankings…..
1. 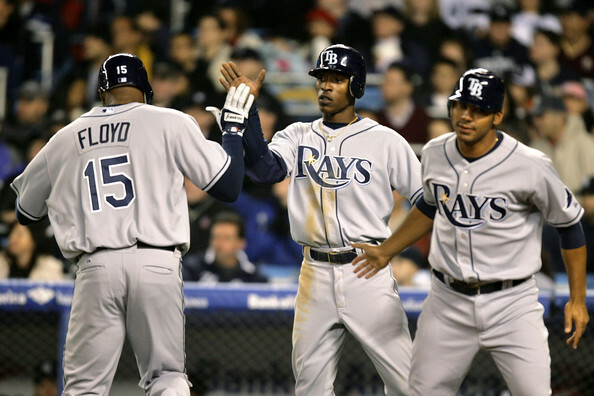 Tampa Bay Rays (41-26)—Amazingly, the Rays have a better road record (23-11) than a home record (18-15). Also amazingly is how they jumped out of the gate and have stayed in front—with their usual formula of strong pitching (3.55 ERA leads the AL), speed (major league best 76 steals) and defense. 2. New York Yankees (41-26)—Don’t look now, but the Yankees have caught up to Tampa. They just have too much talent for the Rays to keep them down all season. 3. Boston Red Sox (41-28)—Struggling to keep pace with the Rays and Yanks, but now just one game back and right in the thick of it. Does anyone else feel bad for the Orioles and Blue Jays? 4. Atlanta Braves (40-28)—A huge surprise to be leading the NL East on June 19, but not as big a surprise as the Phillies sitting in third place. 5. Minnesota Twins (38-29)—Ignited by a new ball park and a fat new contract for their superstar catcher Joe Mauer, the Twins are going to run away with the AL Central because no one else wants to. 6. San Diego Padres (39-28)—Definitely the surprise of the first two months, Bud Black has this Padres team over-achieving. They recently relinquished first place, but took it right back, and the Padres may stay in the hunt because of how well they fare in those close, low-scoring games. 7. New York Mets (39-28)—Here’s another shocker. The Mets were picked by most pundits to be a fourth or fifth place team. And here they are battling the Braves for NL East supremacy. But the biggest surprise has been the starting rotation, where guys like Mike Pelfrey, RA Dickey and Jon Niese are reminding Mets fans of the Seaver/Koosman/Matlack days. And we haven’t even mentioned Johan Santana. 8. Los Angeles Dodgers (38-29)—They’ve quietly made their move from bottom feeders to frontrunners, and they have the talent to stay there. But seriously, Manny Ramirez has SEVEN home runs on June 19? Hmmmm. 10. San Francisco Giants (37-29)—With Barry Zito looking like his old self, this team is extremely dangerous with him, all-world Tim Lincecum, Matt Cain and Jonathan Sanchez. Tie 10. Detroit Tigers (37-29)--A 7-game winning streak has them right here and only a half-game back of the Twins. 1) The use of all CAPS to get a point across. Using all CAPS must be a sign that someone is SHOUTING THEIR POINT. 2) In classic sports commenting fashion, if you don’t agree with something someone wrote, call the writer a name. God forbid someone have an opinion that doesn’t match our own. I think the list is good. However, the Rays are having some issues and the pace they were on was just too much to continue. I will also note that the Yankee should be happy about their pitching because for the most part they are not hitting especialy with men on. As for Texas, ok move them up and drop San Deigo down to 9th spot. and does that mean the Mets and Padres should also be fourth?